If your organization uses Microsoft SQL Server to store financial information, customer records, intellectual property or other sensitive data, database security and SQL Server performance are of the utmost importance. You need to know exactly what is happening in your database and be able to quickly respond to critical events, such as changes to critical data or SQL Server instance configuration. When a suspicious event happens, SQL alerts can send you a message to let you know, so you can take action quickly. There are three types of event alerts you can set up through the SQL Server Agent: alerts on SQL Server events, alerts on performance conditions and alerts on Windows Management Instrumentation events derived from WMI logs. Using Transact-SQL, you can add notifications for errors with a specified severity level, or for a particular potentially harmful event, such as row, table or database deletion. Whenever an entry in the log matches the event description, you will receive a notification. Alerts of this sort have some significant drawbacks, though. Each time you want to include an event in the list of alert triggers, you have to create a T-SQL script, which can be a time-consuming and error-prone process. In addition, the notification you get can hardly be called easy to understand. Netwrix Auditor for SQL Server simplifies alerting in multiple ways. When a suspicious event happens, you receive a near-real-time alert that details exactly who changed what, when and where, in a human-readable form. The solution provides multiple predefined alerts on threat patterns, such as a spike in failed logons or modification of a database, so all you have to do is specify the alert recipients and choose a notification method. Adding custom alerts doesn’t require any scripting, which saves you valuable time for more critical tasks. 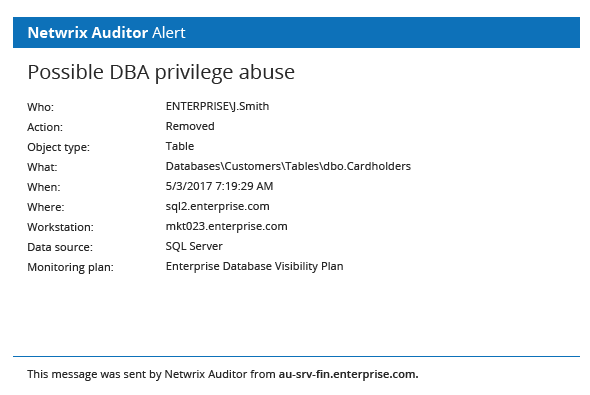 Moreover, Netwrix Auditor provides the tools you need to take action quickly to protect your systems and your organization. Whenever you receive an alert, you can easily investigate further using the interactive search and predefined reports on changes and logon activity. These features provide the context of the incident in SQL Server, and also the broader picture of the whole IT environment, so you can determine whether other critical systems, such as Active Directory and Windows file servers, were also affected.